In recent years, there has been increasing scholarly interest in the history of museums, academies and major exhibitions. There has been, however, little to no sustained interest in the histories of alternative exhibitions (single artwork, solo artist, artist-mounted, entrepreneurial, privately funded, ephemeral, etc.) with the notable exception of those publications that deal with situations involving major artists or those who would become so - for example J.L. David’s exhibition of Intervention of the Sabine Women (1799) and The First Impressionist Exhibition of 1874 - despite the fact that these sorts of exhibitions and critical scholarship about them have become commonplace (and no less important) in the contemporary art world. The present volume uses and contextualizes eleven case studies to advance some overarching themes and commonalities among alternative exhibitions in the long modern period from the late-eighteenth to the late-twentieth centuries and beyond. These include the issue of control in the interrelation and elision of the roles of artist and curator, and the relationship of such alternative exhibitions to the dominant modes, structures of display and cultural ideology. 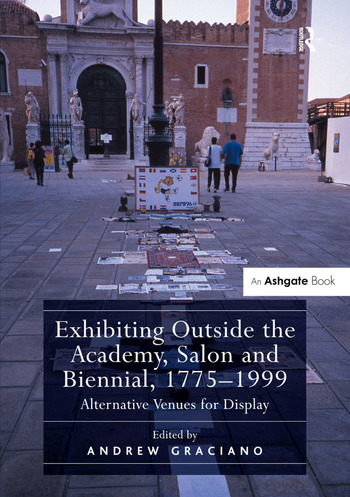 Contents: Introduction: Alternative venues, Andrew Graciano; Nathaniel Hone’s 1775 exhibition: the first single-artist retrospective, Konstantinos Stefanis; Branding Shakespeare: Boydell's Shakespeare gallery and the politics of display, Heather McPherson; Fantasy and rivalry: Jean-Baptiste Regnault’s solo exhibition, Paris 1800, Katie Hanson; Rereading ‘Court’ in the touring exhibition of Rembrandt Peale’s Court of Death (1820), Tanya Pohrt; ‘Plasmati dalle sue mani’: Canova’s touch and the Gipsoteca of Possagno, Christina Ferando; Art history as spectacle: blockbuster exhibitions in 1850s England, Amy M. Von Lintel; Merging form and formlessness: the 1892 monotype exhibition by Edgar Degas, Christine Y. Hahn; The radical work of Oskar Kokoschka and the alternative venues of Die Kunstschauen of 1908-1909, Vienna, Austria, Rosa J.H. Berland; Bringing the boudoir into the gallery: Florine Stettheimer’s ‘failed’ solo exhibition, Karen Stock; Exhibiting the museum-function: Marcel Broodthaers and the Musée d’Art Moderne, département des Aigles, Julian Jason Haladyn; Georges Adéagbo: between artwork and exhibition, Kathryn M. Floyd; Epilogue: control issues: creation, display and meaning, Andrew Graciano; Select bibliography; Index. Andrew Graciano is Associate Professor of Art History at the University of South Carolina, USA. He is author of Joseph Wright, Esq. : Painter and Gentleman (2012) and editor of Visualising the Unseen, Imagining the Unknown, Perfecting the Natural: Art and Science in the 18th and 19th Centuries (2008).